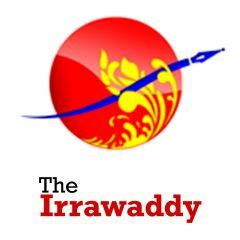 This edited article by Salai Thant Zin is from The Irrawaddy, an independent news site in Myanmar, and is republished on Global Voices as part of a content-sharing agreement. 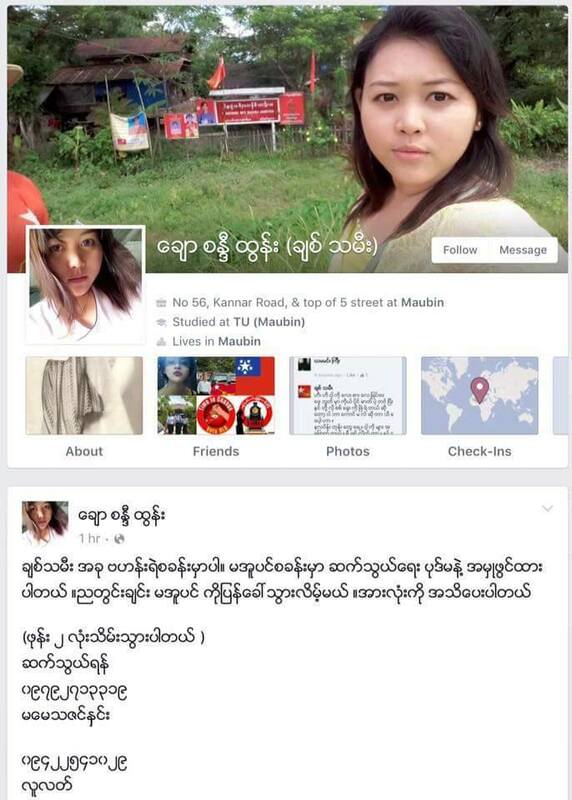 A young woman was brought to trial in Myanmar after sharing a satirical post on social media deemed to be insulting to the country's military. 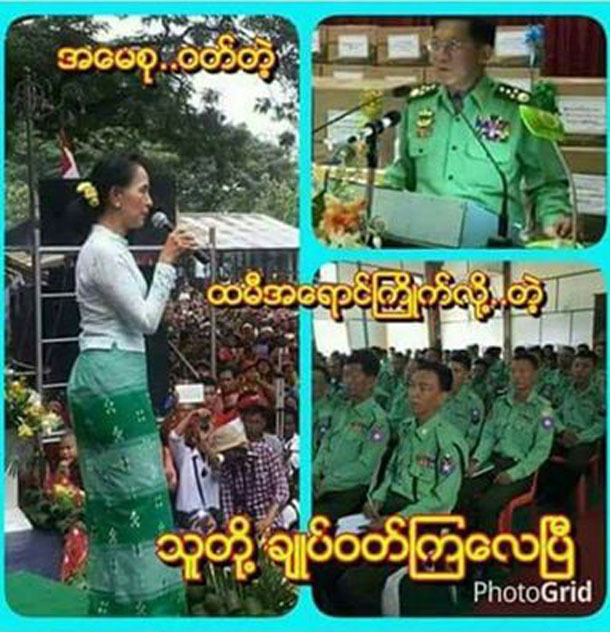 Twenty-five-year-old Chaw Sandi Tun, also known as Chit Thami, took to Facebook to share a digital photo collage that juxtaposed Aung San Suu Kyi wearing a green traditional htamein, with military Commander-in-Chief Snr-Gen Min Aung Hlaing and other military service personnel donning newly redesigned uniforms that are a similar shade of green. The post compared the new military garb to the apparel of the renowned opposition leader, who chairs the National League for Democracy (NLD) and once served nearly two decades of house arrest under the former military junta. [They] like the color of the longyi of Aunti Suu [Aung San Suu Kyi], so they had it tailored and are now wearing it. The image hit a nerve in Myanmar’s conservative society, where it is considered an insult to imply that a man would wear htamein, the woman’s version of the traditional Burmese sarong known as longyi. After her arrest on October 12 at a meditation center in Yangon, Chaw Sandi Tun was taken to the Maubin police station where she has since been in custody. She was brought to trial at noon the next day and will return on October 27, according to a member of the local students’ union that is assisting her case. Chaw Sandi Tun, who earned a Bachelor’s degree in technology, is a former member of the Maubinn District Students’ Union and took part in student demonstrations against a new National Education Law earlier this year in Irrawaddy Division. She has since resigned from the students’ union and joined the local chapter of the NLD, and now works on the party’s election campaign. Chaw Sandi Tun is at least the second person to be arrested this year after sharing a satirical online post viewed as critical of the military. In February, police arrested Aung Nay Myo, a freelance photographer in Monywa, after he posted a satirical photo on his Facebook page that reportedly mocked Myanmar officials. He was released after three days of interrogation.